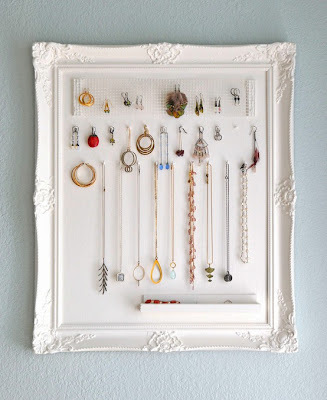 I wanted a different way to store my necklaces. I kept my necklaces in a jewelry box, but since they were tucked away and I didn't see them, I didn't wear them often. 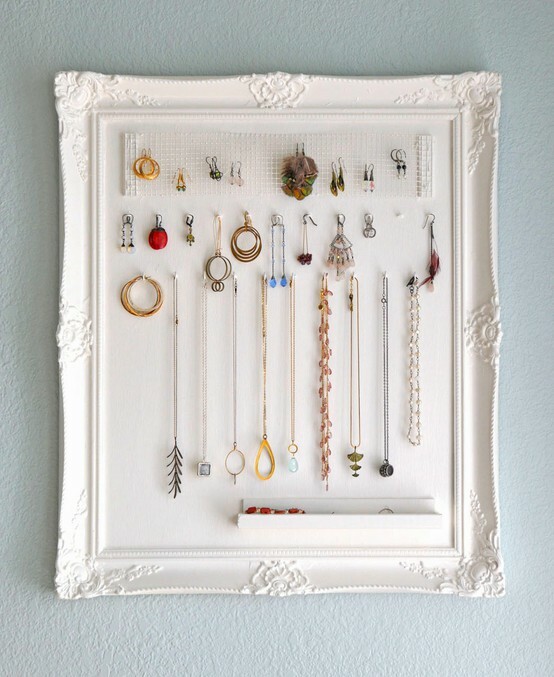 My inspiration came from this pin on my Organizing Pinterest board. I bought an inexpensive old frame years ago. It was just the frame with no glass or artwork in it. I really didn't know what I was going to do with it, but it had such a pretty rustic finish. It was already pretty shabby so I added a touch of gold paint to give it a little chic. I used some cork that I had from an old cork board I wasn't using any more and wrapped it in fabric. I used a staple gun to staple the fabric to the back of the cork board and popped the whole thing into the frame. Then I screwed some hooks into the cork board to hold the necklaces. The tutorial for this project is here. This was another easy project. I had all the materials, too. I love it when I don't have to buy anything! Now that I can see my necklaces, I wear them more often and I can enjoy them as art even when I'm not wearing them! love it!! that looks awesome! I love it! 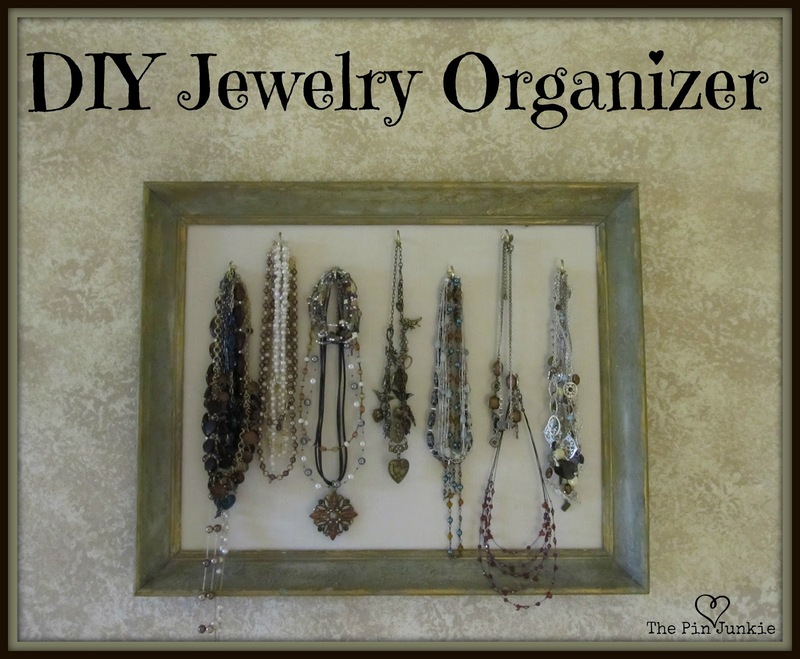 It looks like your jewelry is art, plus it's a great way to keep it organized! Thanks for sharing at The Fun In Functional! Great idea - being organized helps get out the door faster, too! Thanks for sharing this wonderful project with the Whip it Up Wednesday party! Love it! You did a great job. I just caved and joined Pinterest. Thanks for sharing with Share Your Cup. Impressed with the creativity of yours. This is simple to create & inexpensive too. Looking forward to more stuff like this from you. It is indeed so nice and such a unique idea. I do love to try to make one and put my stuffs on it. Thanks. I am stopping by from Whimsy Wednesday...and I stumbled upon this AMAZNG post. I am pinning this immediately! You took such a nice spin on this project!